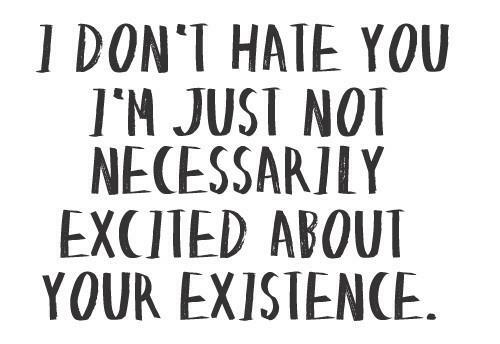 I love it when someone insults me. It means I don't have to play nice anymore. 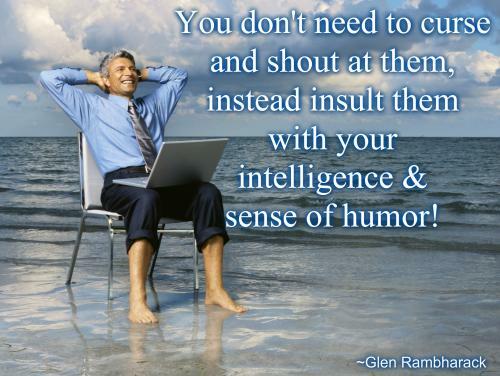 You don't need to curse and shout at them, instead insult them with your intelligence & sense of humor! You don't need to curse and shout at them, instead insult them with your intelligence and sense of humor! Don't give anyone the power to insult you just because they can't see your worth. Guys insult each other and don't really mean it! Girls compliment each other and don't really mean it! You must be a special kind of stupid to think acting like a jerk is attractive to girls. Criticism is pointing the raw truth on how someone can make change or improve for the better. While an insult is using the negative truth purposely to make someone feel bad or hurt other's feelings. Criticism is unintentional....Insult is intentionally hitting you. I am always misunderstood about my post.